On the 30th of May 1944, according to Scott, Russia issued a set of two stamps to commemorate the "Day of Nations United Against Germany" which was June 14, 1944. 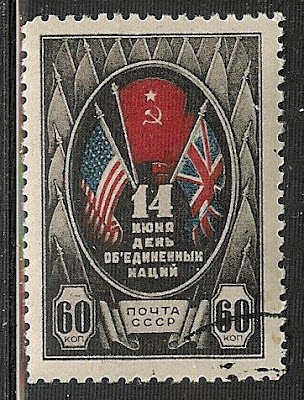 The stamps which are visually appealing feature the flags of the US, Russia and Great Britain. The two values issued were 60 kopecks and 3 roubles. 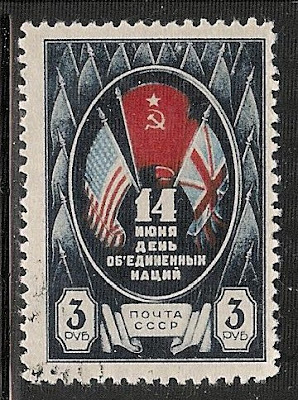 What intrigues me about the set is that if we use the day of issue from the Scott Catalogue Russia was telegraphing the imminent invasion by the allies. The date of issue of these stamps is only 7 days before the D-Day invasion that Canada, Britian and the US executed on the 6th of June. In researching this issue It is interesting to find that Russian history see's the British, Canadian and US effort on D-Day as only a small contributing factor the German defeat of World War II. The majority of Russians have been taught and believe that they could have done it with out the rest of the Allies. None the less I think these are a nice set of stamps issued to celebrate the worlds major powers uniting to defeat the NAZI reign of terror.